Earlier this week I wrote about the (alleged) crown of Montezuma. The main element of that crown was not a gem or gold structural elements, but the exquisite iridescent emerald feathers of Pharomachrus mocinno, the resplendent quetzal. These birds live in the rainforests of Central America from southern Mexico down across Guatemala and into western Panama. They are solitary birds which generally eat fruit (which they supplement with small animals). They are weak fliers and are preyed on by hawks, eagles, owls, and even toucanets and squirrels (it must be embarrassing to be eaten by a small mean toucan or a squirrel). Because of their exquisite feathers resplendent quetzals were associated with the flying snake god Quetzalcotl by various Mesoamerican civilizations. Elite individuals of the Maya and the Aztecs did indeed wear headdresses made from quetzal feathers, and it was taboo to kill the bird. Feathers were collected from captured birds which were set free (for quetzals do not flourish in captivity). They were seen as symbols of divinity, freedom, and wealth (Guatemalan money is known as the quetzal). I wish I could tell you more about this jewel-like bird, but they quietly keep their secrets. A myth of the conquest is that before Spaniards came to the Americas, quetzals sang beautifully and had plain breasts, but since that time their breasts have been red with blood and they have been silent. They do indeed seem to be a stupendous visual phenomenon (like today’s post which is really about the pictures of this exquisite animal). I only just got back from work, so I am going to feature a quick post which I have always wanted to write. A color which I think is extremely beautiful is hunter green–a dark yet vivid green. This is a classical color which has been mentioned frequently in English since the end of the 19th century. Hunter Green, as you might imagine, was named for the green garb which 19th century hunters wore in the field (a much richer and bluer green than the olive drab which soldiers and sportsmen wear today. I was hoping there was more to say about the history of the color (Because I think it is quite splendid) but, alas, that was all I could find. Here is a picture of a nineteenth century hunter! It is hard to imagine a color most beautiful than the color green. It is the color of fertility, of mystery, of life itself (which, unless you are an undersea tubeworm, depends on photosynthesis). Green is also the color of Islam. Today is June 8th and I have a short post about a long and complicated subject. June 8th of the year 632 (common era) was the day that the Prophet Muhammad died in Medina in his wife Aisha’s house. Other principle figures of major world religion died in the distant past, or ascended bodily into heaven, or underwent other mysterious supernatural transformations. Muhammad’s end was not like that. He died at a real date and in a real place and he was buried where he expired—in Aisha’s house next to a mosque. Islam subsequently became a mighty force in the world, and the al-Masjid al-Nabawi mosque in Medina grew into an enormous edifice swallowing up the original house and grave. Muhammad’s final resting place, however is only marked by a somewhat austere green dome (which was built by the Ottoman Turks, many centuries after the time of the Prophet). Somewhat shamefully, my feelings about Islam fluctuate greatly based on extraneous circumstances, however I have always liked the green dome enormously on aesthetic grounds (indeed it has become a symbol of Medina and of Islam itself). It is a lovely shape and captivating color. The dome’s touching mixture of subdued grandeur and human scale has protected it from those who have wished to replace it with a grander edifice, and from those who wish to replace it with austere nothingness. The Wahhabi version of Islam, which is ascendant in Saudi Arabia right now, inclines towards the latter view, and some Wahhabi religious scholars have called for the razing of the green dome (an act which would infuriate other Islamic sects). The kings of Saudi Arabia love gaudy finery but they detest antiquities (which speak of a more cosmopolitan and permissive Arabia which existed before their absolutism and their oil-soaked personal opulence). Throughout Saudi Arabia, elegant old buildings have vanished to be replaced with monstrous modern travesties. I wonder if the double-edged sword of Wahhabi asceticism/Saudi decadence will claim the green mosque in the same way it has hollowed out the revelations of Muhammad. For years my most popular blog post was about leprechauns…so I need to make some Saint Patrick’s art pronto! However before we get there, here are some weird green flounder artworks to lead up to the holiday. Spring is almost here, even if the thermometer says otherwise. Some kelly green artwork should remind us of that fact (even if flatfish are not traditionally spring green). The Brazilian Goldsmith Carlos Martin manufactured the Imperial Crown of Brazil in 1841 for the coronation of Emperor Dom Pedro II. The crown is also known as the Diamantine Crown—because it is covered with 630 diamonds—ooh, so sparkly! I guess, the crown also has 77 large pearls too, but nobody really talks about them. 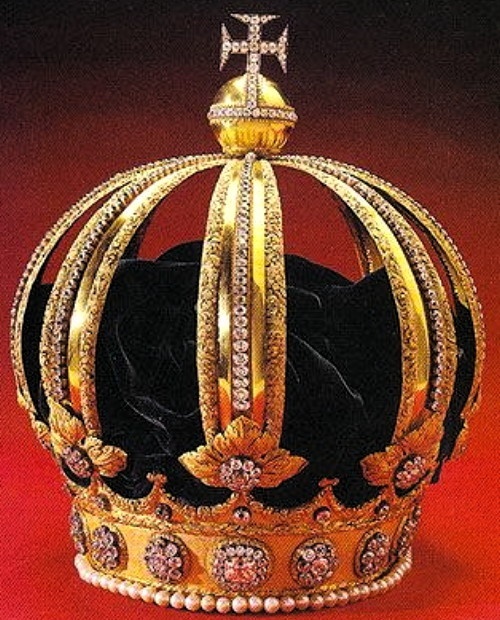 The imperial crown of Pedro II replaced the unremarkable crown of the extremely remarkable Dom Pedro I, a revolutionary and reformer who was responsible for many of the things which went right for Brazil. We’ll have more to say about him later this week. With 8 magnificent golden arches meeting beneath an orb and cross, the crown of Brazil echoes the crown of Portugal…and rightly so, since the great South American nation began as the most magnificent Portuguese colony (although Goa, Macau, Agola, and Mozambique were quite nice too). Here is a picture of Emperor Pedro II looking exceedingly magnificent (and perhaps a bit silly too) as he opens the annual Parliamentary session in 1872. So lovely was the crown of Brazil that is was the central motif of the Brazilian flag until the monarchy was abolished in 1889. Unlike other crowns which were sold or stolen after independence, the Brazilian crown has remained in posession of the Brazilian republic and can currently be seen at the Imperial Palace in the City of Petrópolis.